BlogHome » Case Studies » The Fire Service Called Us! Who’d have guessed a reverse emergency call!! 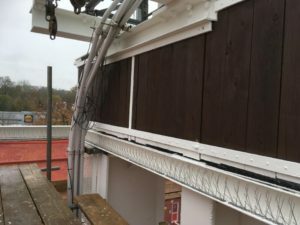 The Fire Service in Kent needed us to stop invading pigeons who were living under the canopies of the station areas where engines and other fire fighting equipment were kept. At other stations birds were roosting on gantries and beams on drill towers. The challenge here was ensuring we kept on our guard should there have been a ‘shout’ and it did happen quite a few times which, to be honest, made me feel a bit jealous! The stations we attended needed a variety of bird control deterrents ranging from bird control netting and pigeon control spikes. The original bird netting was, to say the least, it bit worse for wear. It was apparent this had been in place for a number of years and the pigeons were now taking advantage of the tears in the net so moved in. Every boys dream to climb the fire drill tower. Kent Bird Control Services were tasked with installing pigeon deterrent spikes on two drill tower is the county. Fitting the spikes had to be balanced with keeping the birds off the beams whilst not hindering access for the fire personnel when they used the towers for training. Of course, we managed to do this successfully and the pigeons have stayed away.